$19.50 / Tutorial - New Lower Prices! At macProVideo.com, we have the best Final Cut Pro X training available on the web ... and we also have the lowest prices you'll find anywhere for professionally produced FCP X Tutorials. BTW, we've got an incredible bundle of 8 FCP X tutorials coming in the next few weeks. If you buy them all as a bundle now, you can save 50% off the release price of these titles - that's just $68.25 for 8 incredible tutorialsby one of the world's best FCP educators, Michael Wohl. Many of you know Michael Wohl from the amazing tutorials he's produced for macProVideo.com over the last 5 years. But Michael is more than just a video trainer - Michael is one of the original designers of the Final Cut Pro software!He's also one of Apple's main FCP X courseware authors, and a central figure in writing the documentation for Apple's FCP X Suite of applications, including Motion. 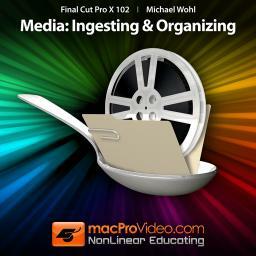 Michael Wohl is an incredible educator with deep insider knowledge of how Final Cut Pro X works. In my opinion, there's no better educator in the world for teaching FCP X editing skills ... we're extremely pleased to have Michael as part of our team here at macProVideo.com! 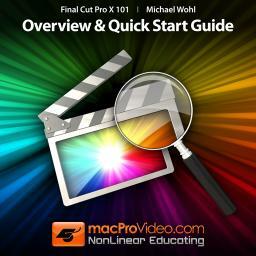 For the first time in the history of macProVideo.com, we're giving away our Final Cut Pro X 101 tutorial! This 1-hour overview and FCP X Quick Start Guide contains all of the info you need to know to hit the ground running with Apple's Final Cut Pro X. Use this tutorial to transfer your existing FCP knowledge to the new FCP X interface, and get up to speed on the latest features of this incredible new software. In this tutorial, Michael Wohl gives you an advance look at the incredible Magnetic Timeline, Clip Connections, Compound Clips, and the new, intuitive Inline Precision Editor. He also covers the built-in Color Matching functions, the incredible array of audio enhancements, the media library, and much, much more. In this tutorial, Michael Wohl explains how each clip is analyzed for its content, shot type and image stability. What's cool is that all your audio is checked and corrected for noise and hum too. This means no more exporting to other audio programs and searching for esoteric plugins to fix pesky sound issues. It's all done for you in Final Cut Pro X.